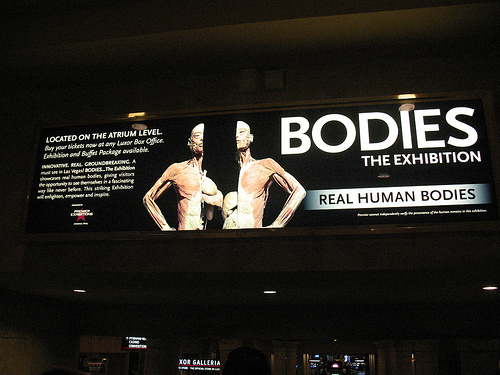 Yesterday, my husband and I went to see the Bodies exhibit at the Luxor. I’ve mentioned the exhibit in this blog before, but had never seen it. I must admit I was a little nervous about what the experience would be like. It was fascinating! Of course the bio geek in me went all out. I read every card and fully examined every display. In fact, the various ticket sellers (we got a dicount using Tix4Tonight) told us to allow one to 1.5 hours. So, knowing they closed at 10pm, we arrived by 8pm. They had to shoo us out! And I missed much of the last two rooms. So, if you are the type of person, like I am, that like to really look at science displays and learn from them … allow at least 2.5 hours for this exhibit. And it was small … I’m sure that the Bodies exhibits at regular museums are much larger.